The Anti-Monitor is a fictional character, a comic book supervillain and the antagonist of the 1985 DC Comics miniseries Crisis on Infinite Earths. He first appeared in Crisis on Infinite Earths #2 (although he remained in shadow until Crisis on Infinite Earths #5), and was destroyed in Crisis on Infinite Earths #12, only to return after a long absence in Green Lantern: Sinestro Corps Special #1 (Aug. 2007). 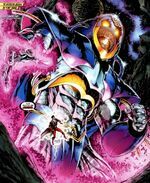 In 2009, Anti-Monitor was ranked as IGN's 49th greatest Comic Book Villain of All Time. Origin: Oa started out as a peaceful planet with citizens of vast mental abilities and ambition. One of them, Krona, developed a screen to witness the dawn of time and caused an explosion on Oa. He was then sentenced to live forever in energy form. What happened during that explosion was the beginning of the Multiverse and all of the multitudes of its universes. Once the Oans took it upon themselves to fight for justice, some believed that they should destroy all evil. The other Oans did not agree and a civil war began. The ones of malevolent nature left for the dimension of Qward and sought the means to become all-mighty. In this universe, the Anti-monitor was born on one of the moons as an excess of great energy taking form. The Anti-Monitor is a powerful being that existed within the Anti-Matter Universe. In this universe, the Anti-monitor was born on one of the moons as an excess of great energy taking form. Maltus started out as a peaceful planet with citizens of vast mental abilities and ambition. One of them, Krona, was fascinated with the origin of the universe, despite the existing taboo regarding to learning it. Despite this, Krona developed a screen to witness the dawn of time.However, a cosmic lightning bolt splintered the machine,causing a explosion that would have killed Krona had he not been immortal. What happened during that explosion was evil spreading through the universe, and the creation of the Multiverse and the evil Anti-Matter Universe. For his crime, Krona was reduced to a disembodied energy to circle the universe harmlessly. Feeling guilty for their brother's actions, the Oans believed they should fight all evil. However, they disagreed on that, civil war began. The ones of malevolent nature left for the dimension of Oa and sought the means to become all-mighty. In the Anti-Matter universe, the Anti-Monitor was born on one of the moons of Qward as an excess of great energy taking form. At that same time in the positive matter universe, The Monitor was born of similar origin in one of Oa's moon. Soon the Anti-Monitor took over Qward by mere force and created a legion of troops with the power to throw lightning bolts. These people are called the Thunderers. Those among theThunderer Elite, those the Anti-Monitor considered the most evil, he changed into his personal guard, the Shadow Demons. Once he sensed The Monitor in the positive universe, he began a 1,000,000 year long war with him, which ended in both of them losing consciousness. After 9,000,000 years of inactivity from either monitor, Pariah came up in his universe. Being the greatest scientist of all time, he sought to learn the secrets of the origin of the universe. Despite his universe's councils' objections, he created an anti-matter cube with which he safely observed the origin of the universe. This origin is a giant hand reaching from an infinitesimal abyss and forming a new universe. While observing this, the Anti-Monitor and The Monitor were freed and the Anti-Monitor converted the anti-matter into energy and used it to destroy Pariah's universe. After destroying this universe, he drained its energy once again and became even stronger. Along with this, the destruction of a positive matter universe caused the anti-matter universe to expand and make the Anti-Monitor even stronger. With this knowledge in hand, the Anti-Monitor set out to destroy all of the positive matter universes and, therefore, make himself as powerful as possible. During all of this, Pariah was alone for millions of years in his anti-matter chamber. Once The Monitor realized what the Anti-Monitor’s plan was, he set out to prevent it. He endowed Pariah with the curses of immortality and being transported to every universe at the moment of its destruction. 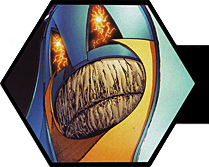 While doing what he could to delay the Anti-Monitor, The Monitor set up a series of towers that would protect Earth-One and Earth-Two from destruction, as well as Earth-S, Earth-X, and Earth-Four. The Anti-Monitor did not know this, but in manipulating The Monitor’s confidante, Harbinger, to kill The Monitor, this powered the machines to work and the two universes were safe from his grasp. 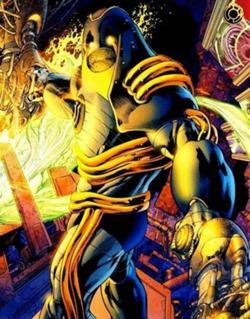 In an attempt to destroy the towers, the Anti-Monitor sent his shadow legions to destroy them, but that plan was thwarted by both Earths’ heroes and villains. One of these villains, the second Psycho Pirate, switched sides and joined the Anti-Monitor in hope of a universe to manipulate the emotions of. The Anti-Monitor also reconfigured the Red Tornado to do his bidding for a short while as well as give The Flash (Barry Allen) to Psycho Pirate to play with his emotions. Once the Monitor was killed and the towers were powered up, both Earth-One and Earth-Two, along with all of time itself became connected at one moment in time. To please Psycho Pirate, the Anti-Monitor enhanced his powers and allowed him to manipulate all of Earth-S, Earth-Four, and Earth-X. After causing much havoc and betrayals, Psycho Pirate was thwarted by Harbinger and he lost much of his power. Then Earth-One and Earth-Two's heroes entered the anti-matter universe with the aid of Alexander Luthor. Alex is the son of Lex and Lois Luthor of Earth-Three, who was saved and endowed with control over positive matter and anti-matter. This enabled him to send Earth's heroes safely to the Anti-Monitor's universe. After they arrived at his citadel of living rock, they fought their way through to the core where Supergirl combated the Anti-Monitor. He had not collected much anti-matter recently, so he was very vulnerable and no where near as strong as he could be. After having his outer shell crushed by Supergirl, he was loose energy that needed to be contained. However he concentrated all of his energy directly at Supergirl and killed her while she destroyed the core and entire ship. He barely escaped in an escape pod, but both the Anti-Monitor and Earth's heroes escaped. The Anti-Monitor returned to his other ship of living rock and the heroes returned to Earth-One, which was now separate from Earth-Two and no longer of one time. Upon returning to his citadel, the Anti-Monitor forgave Psycho Pirate because he had nobody else to pick from at the moment with the ability to manipulate emotions. He also returned to oversee the near completion of his ultimate weapon, the anti-matter canon, which will destroy the remaining five universes once and for all. All this time, the Flash has been waiting and concentrating on the proper moment to attack, which was then. He easily got out of a sticky snare and beat Psycho Pirate into submission. After getting his cooperation, the Flash ran the Psycho Pirate around the entire citadel and had him manipulate the Thunderers to turn on the Anti-Monitor and attack him, which they did. While they did so, the Flash entered the core of the anti-matter canon and reversed the energy flow out of it. Upon doing so, the Flash exceeded the speed of light and was destroyed along with the canon. After easily dispersing the atoms of his Thunderers, the Anti-Monitor realized that his weapon was destroyed and that he would have to take a more abstract approach. He drained the anti-matter energy of over 1,000,000 worlds and used it to travel back to the dawn of time, and Pariah followed due to his curse. Eventually after fighting a mini-war with the villains of Earth, its heroes and villains, along with a Superboy from a destroyed Earth-Prime, barely reached the dawn of time through a series of manipulations of powers, one of which was the Spectre powering their journey. Once they reached the Anti-Monitor, they attacked him with all of their power, but to no avail. He drained all of their life force and used it to attempt to alter history from the dawn of time. It turns out that the hand that Pariah and Krona witnessed at the dawn of time was the Anti-Monitor's, but this time he was confronted by the Spectre. Being backed up in power by all of the most powerful sorcerers there are, the Spectre brought an end to the Anti-Monitor's meddling in time. Upon slightly changing time, the multiverse became only two, the positive matter and the anti-matter universes. Earth’s heroes and villains that were present at the battle at the dawn of time were revived and some were placed back into the timestream while some others were there without a past except to the others that were at the dawn of time. The Anti-Monitor was also sent back to the anti-matter universe, his origin. Upon returning, he deployed literally countless shadow creatures to take the only Earth by force, but he also brought only the Earth into his universe. Upon arriving, Earth’s heroes are greeted by the Anti-Monitor and they attack him. Also at this time, the world’s greatest sorcerers, except the Spectre, have contained all of the shadow creatures into a mystical sphere. However, as the heroes start to lose in their assault on the Anti-Monitor, they deploy their secret attack set up by Harbinger, Alex Luthor, and Pariah. Alex uses his powers to drain as much anti-matter energy out of the Anti-Monitor as possible while the new Dr. Light, a female hero, drains the energy from a star. Then all at once, Dr. Light with the power of a star in her body, all of the heroes, Alex, and Harbinger attacked the Anti-Monitor and crushed him into a floating rock. Believing the Anti-Monitor to be dead, many of the heroes left the anti-matter universe through Alex, leaving for the most part Superman of Earth-Two and Earth-One, Superboy-Prime, Lady Quark, and Alex Luthor. In an attempt to catch them off guard, the living Anti-Monitor consumed the energy in his shadow creatures and blasted Earth-Two's Wonder Woman in nothing. (He actually accidentally reversed her time and she went through a rebirth) Then Superman of Earth-Two knocked Earth-One’s Superman and Lady Quark back into the positive universe through Alex and followed up with an attack on the Anti-Monitor with Superboy-Prime. Upon this moment, the Anti-Monitor became weakened and it was revealed that the sorcerers that contained the shadow demons poisoned them and this, in turn, poisoned the Anti-Monitor. In this moment of weakness, Superman of Earth-Two and Superboy-Prime physically attacked the Anti-Monitor and hurled him once again into the rock. Then they kept pounding on the rocks, but he still kept coming back and started to squeeze the life out Superman-Two and Superboy-Prime. At this moment, Darkseid decided to interfere and used Alex as a conduit to blast the Anti-Monitor with an energy beam from Alex’s eyes. He was then sent hurtling into a star and his crust finally gave out and his energy form became all that was left of the Anti-Monitor's self. In his last suicidal attempt to bring Superboy-Prime, Superman-Two, and Alex with him, he launched himself as an energy sphere from the star, but met his final and ultimate demise as Superman-Two shattered him into molecules of incoherent energy. He truly did die in this last attempt of murder, and is only remembered by those that were at the dawn of time and/or the battle in the anti-matter universe. Even though he died, it was too late for any of the remaining people to return to the Earth, so they went to an alternate dimension and stayed there for years with Lois of Earth-Two. Superman (and Lois Lane) of Earth-Two, Superboy-Prime of Earth-Prime, and Alexander Luthor, Jr. of Earth-Three, from their home in the hidden pocket universe, were revealed to be observing the events of the newly-formed universe, as well as the actions of its heroes. Upon observing the events leading up to Infinite Crisis, the heroes returned to the universe in an attempt to restore Earth-Two's existence, at the expense of Earth-One. 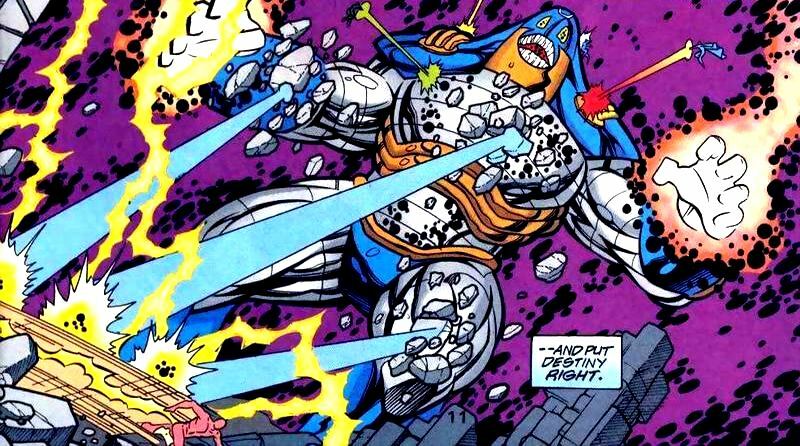 The Anti-Monitor's remains were then used as part of a tuning fork, similar to the one's used during the first Crisis. The tower then created the vibrational frequency that Earth-Two was on prior to its nonexistence, which in turn recreated Earth-Two with no visible expense to Earth-One, save the movement of characters who originated on Earth-Two to the recreated Earth-Two. Alexander Luthor then recreated the other Earths with his tuning fork, with their respective heroes forcibly migrating to said Earths. Superboy-Prime (followed soon by Bart Allen) then returned from the Speed Force wearing what appeared to be select elements of the Anti-Monitor's armor, using it as a yellow sunlight collector. How he obtained it is still unrevealed, although evidence suggests that he built it himself while he was imprisoned and it merely resembles the Anti-Monitor's armour, although whether by intention or coincidence is unconfirmed. 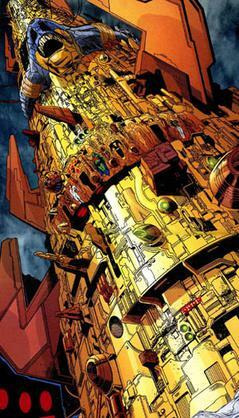 Ultimately, the tower was destroyed when Kon-El, the modern Superboy, and Superboy-Prime crashed into it while fighting each other, Kon-El dying in the arms of Wonder Girl as Superboy-Prime fled. It was revealed that the Anti-Monitor was reborn following the recreation of the Multiverse and that he has been fueling Sinestro's ideology since the return of Hal Jordan, acting as the Sinestro Corps' "Guardian of Fear". His body was rebuilt by the Manhunters, and in addition, he has recruited Superman-Prime, the Cyborg Superman, and Parallax, who was using Kyle Rayner as its host, along with Sinestro as his 'heralds'. During the war between the Sinestro Corps and the Green Lantern Corps, the Anti-Monitor contacted Cyborg Superman to inquire about the status of New Warworld. The cosmic tyrant stated that he would soon abandon Qward and that he would kill Henshaw for his services, allowing him the peace that had for so long evaded the cyborg. When the Lost Lanterns made their way to the antimatter universe to save Hal Jordan and the Ion power, they inadvertently stumbled upon the Anti-Monitor in a basement chamber of his stronghold on Qward. He was seemingly experimenting on or torturing the Ion Entity previously inhabiting Kyle Rayner. He proceeded to kill Ke'Haan before the other Lanterns forced him back, taking the Ion entity from the planet and the antimatter universe. 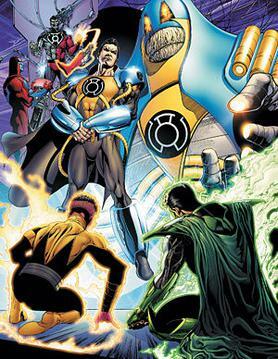 The Anti-Monitor pursued the Lanterns for a short while, long enough for Hal Jordan, Guy Gardner, John Stewart and the other Lanterns to learn of his return. Having this vital information, they then leave Qward. Shortly after, the Sinestro Corps launched its attack on Earth. The Anti-Monitor traveled to the planet aboard New Warworld, and landed shortly thereafter, along with Sinestro. He was attacked by Sodam Yat and other members of the Green Lantern Corps, but the tyrant easily killed the two unnamed beings and severely injured the Daxamite Lantern. The Anti-Monitor begins to siphon the positive matter of New York City to create his traditional antimatter waves. However, he is attacked by the Guardians of the Universe, angry at being impotent during his first war. The Guardians begin to crack his armour, while at the same time defeating his heralds (though failing to kill hank Henshaw, much to the cyborg's sorrow), though the Anti-Monitor was able to grasp at one of them and burn her severely. John Stewart and Guy Gardner bring down New Warworld and its Yellow Power Battery are detonated next to a trapped Anti-Monitor. Although it succeeded in tearing through most of the Anti-Monitor's armor and weakening him, he survived the explosion. Superman-Prime flies through the Anti-Monitor's chest and hurls his shattered body into space. The Anti-Monitor's shriveled and glowing form crashes on an unknown planet. He is recognized by a dark voice that bids him rise. Too weak to resist or escape, around him forms a Black Lantern Central Power Battery. Shortly after his defeat, a female Guardian that was burned by the Anti-Monitor charged Green Lantern Ash of Space Sector 650 with the task of locating the Anti-Monitor's corpse. He eventually found part of the Anti-Monitor's helmet, the trajectory of which indicated that the Anti-Monitor's body was oriented toward the long abandoned Sector 666. When Lantern Ash and Lantern Saarek located the planet Ryut, they also found the Black Lantern Central Power Battery. All too late, Saarek realized their mistake, as two large hands presumably of the Anti-Monitor reached up, and consumed them. Following this event, the Blackest Night Prophecy came to pass and the Black Lantern Corps emerged where the undead began to consume the emotional energy of living beings in order to energize the Black Lantern Central Power Battery. Once fully charged, the architect of the Anti-Monitor's imprisonment as well as the leader of the Black Lanterns emerged. The Lord of the Unliving known as Nekron had manifested on the mortal plane and transported the Central Power Battery from Ryut to Coast City where he unleashed more Black Lantern Power Rings to bring back the dead and even turn resurrected heroes into Black Lanterns. As the heroes of Earth battled the undead, the superhero known as Dove who unleashed the White Light decided to damage the power source of the Black Lantern Corps. The initial strike led to a backlash of energy hitting Dove and a great voice emerged from the Central Power Battery that demanded Nekron to let him out. Dove quickly told Cyborg of the Teen Titans that "someone" was within the great Battery. Later, Guy Gardner uncovered the truth that the Anti-Monitor resided within the battery as his form was desperately trying to escape imprisonment. Inquiring from his power ring, Gardner learned that Nekron had imprisoned the Anti-Monitor and was slowly sapping him of his powerful cosmic energies as part of his strategy. Due to this being the case, a partial Black Lantern symbol had formed on the Anti-Monitor though he was only partly undead. The various Lantern Corps attempted to combine their light and destroy the Anti-Monitor but this failed. Munk later revealed that because he was completely transformed into a Black Lantern, the Anti-Monitor was partly immune to the White Light. Angered, the Anti-Monitor used his powers to attack the various Lantern Corps and promised that once he freed himself from the aberration that was the Black Lantern Central Power Battery, he would burn the Earth. His energy blasts at one point were aimed at Princess Iolande but Vath Sarn pushed her out of the way but this came at the cost of his legs being blasted off in the process. In order to defeat the Anti-Monitor, Guy Gardner decided to use the aid of Dove in ending the threat. Calling upon the Red Lantern Corps, he had the Red Lanterns spew their acidic blood into the Anti-Monitor's eyes thus blinding him. This allowed Bedovian to fire Dove's energy into the Anti-Monitor's head thus seemingly defeating him. Later, the imprisoned Ant-Monitor was freed from the Black Lantern Central Power Battery and restored into a living being by the power of the Life Entity. Breaking free from the Black Power Battery, the Anti-Monitor channeled his power to attack Nekron but the Lord of the Unliving banished the cosmic being back into his own dimension. This was because Nekron stated that he had no further use for the Anti-Monitor now that he was freed and he intended to claim the living dimension. After the defeat of Nekron, Sayd decided to become the Guardian of the Orange Lantern Corps in order to decide on the future of all the Corps as threats now existed in both the freed Anti-Monitor and the escaped as well as now living Black Hand. Whilst within the Anti-Matter Universe, the Anti-Monitor was confronted by the now reborn Deadman who fielded a White Lantern Power Ring that had forced a fight between the two. The Anti-Monitor was unsure on who this intruder was and demanded to know who had approached him. Using the White Light energy, Deadman sent a powerful force blast that took the form of Lantern Energy Constructs of the resurrected superheroes of Earth. The attack caused the Anti-Monitor pain and he staggered before the cosmic being fired a powerful energy blast at Deadman. Deadman managed to survive and evaded the Anti-Monitor allowing the powerful cosmic entity to continue his unknown goals in the Anti-Matter Universe. In the shadows, the Anti-Monitor was responsible for subverting the Black Lantern Deathstorm who had uncovered the White Lantern Power Battery. Using his own cosmic powers, the Anti-Monitor managed to prevent the Black Lantern from destroying the repository of life that resided within the Power Battery and commanded Deathstorm to bring it to him. This led to Deathstorm forming Black Lantern versions of the resurrected superheroes of Earth who took the Battery and went into the Anti-Matter Universe in order to deliver it to their new master. Once there, he began attempting to decipher its secrets and the Power Battery had taken something from him when he was freed from the Black Lantern Central Power Battery. During his study, the Earth superhero Firestorm arrived at the scene who transformed the helmet of the Anti-Monitor into a combustable substance and set it on fire. This caused Deathstorm to intervene and, despite the Anti-Monitor commanding him not to harm his hostages, he killed Professor Stein in order to feast on the emotions that emanated from Firestorm as a result of the death. This angered the Anti-Monitor who sent his wrath at Deathstorm but did not destroy the Black Lantern; warning him that if he persisted, he would not hesitate in destroying the undead being. The death of Stein led to Firestorm resolving the differences within his hosts which led to the White Lantern Power Battery determining that he had completed his mission. Shining brightly, it incapacitated the Anti-Monitor and destroyed the Black Lanterns before transporting Firestorm to Earth for its own purpose. The Anti-Monitor was one of the most formidable foes ever faced by the heroes of the DC Universe (or "Multiverse", as it was then). In addition to possessing vast size (varying from several meters to hundreds of meters). He has destroyed and absorbed countless universes, even The Monitor explains that over a thousand universes have been destroyed. Even The Spectre was unable to defeat him even after being augmented by many powerful sorcerers, one even included an fifth dimensional imp. Therefore he wields enough power to destroy a universe. Invulnerability: by the end of the Crisis series, he was able to effortlessly withstand blows from Superman. Universe Absorption: He consumed thousands of positive-matter universes to increase his power, and was able to personally battle scores of the multiverse's strongest heroes simultaneously. He is directly responsible for more deaths than any other known DC supervillain (trillions, at least), including killing Supergirl personally. It seems this ability only is possesed by the Antimonitor of the first Crisis, as the new Anti-Monitor hasn't used this ability if he can. Power Augmentation: The Anti-Monitor also showed capable of greatly augmenting another being's powers, as he did with Psycho-Pirate, whose powers were increased to levels too much for him to handle. Antimatter Waves: ability to create waves that have the power to unmake matter at its most basic level. Anti-Matter Universe Command: he commanded an army of Qwardians and shadow demons, and had access to highly advanced technology capable of shifting, merging, or destroying entire universes. 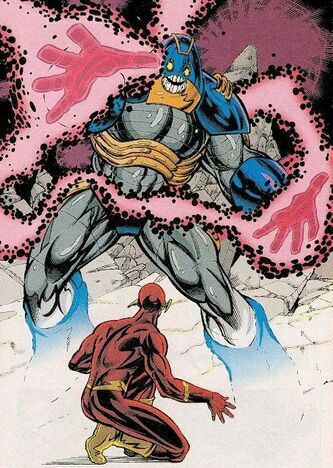 Overconfident: Over the course of the Crisis series, the Anti-Monitor did not demonstrate superior intelligence or strategic abilities; his enormous, overwhelming power was more than sufficient to wipe out whatever resistance he faced. In the end, this proved to be his fatal weakness, as he finally met defeat as the result of a well-timed and carefully prepared plan devised by Earth's superheroes. In addition, during the Sinestro Corps. War, he was confident the Guardians would not remove themselves from Oa, and believed he could defeat them even if they did. When they appeared on Earth however, bearing Ion, they were able to break him down and weaken him while sustaining only one casualty.